Military operations in Lumad communities have heightened since the start of preparation for the opening of classes, according to SOS Network. 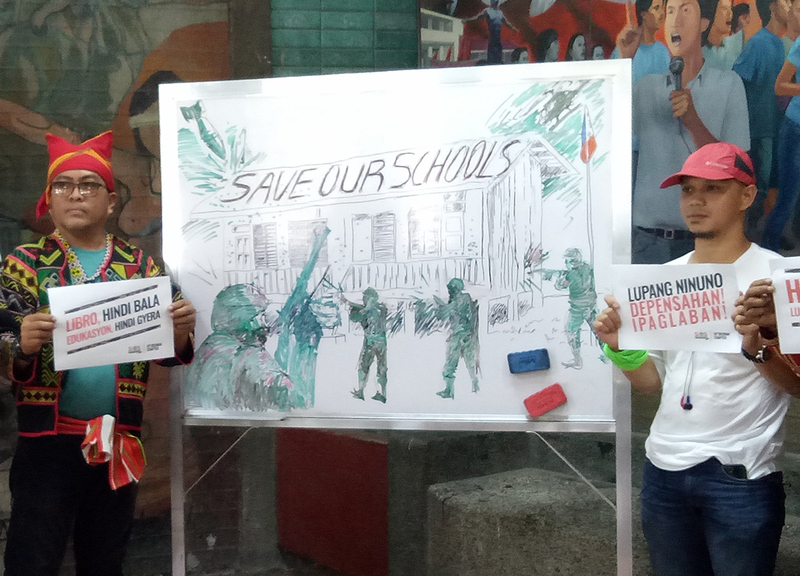 Lumad leaders and members of the UP community condemned the continued intimidation faced by Lumad communities during a press conference by Save Our Schools (SOS) Network in UP Diliman, Friday. According to Kerlan Fanagel, chairperson of PASAKA Confederation of Lumad Organizations in Southern Mindanao, military harassment of Lumad schools has worsened a year after Duterte’s declaration of martial law in Mindanao. “More Lumads had to evacuate. What used to be two sanctuaries became three — one in Bukidnon, another in Davao City, and just recently, affected communities had to seek refuge in Tagum City,” said Fanagel. At least 2,700 students were among those who were affected by forcible displacement. There were also 2,100 students who were not able to graduate in the school year 2017-2018 as a result of intensified militarization in the area which led to their evacuation or shutdown of their schools, added Fanagel. In a report by SOS Network, 134 schools were affected by the attacks while 56 were forcibly closed. On May 26, way before classes started, a Lumad student was wounded while her mother, Beverly Geronimo, was shot dead on their way home after buying school supplies in Agusan Del Sur. Geronimo was the president of the Parents Teachers Community Association (PTCA) of a school operated by the Mindanao Interfaith Services Foundation Inc., (MISFI) Academy where her daughter was enrolled. In Talaingod, Davao del Norte, soldiers have occupied community schools and “conducted roving operations” that harass their students and teachers, according to the Salugpongan Ta-Tanu Igkanogon Community Learning Center (STTILCI). Twenty elements of the Philippine Army’s 51st Infantry Battalion have been staying inside the STTILCI’s Tibucag campus, since May 29. The soldiers asked the teachers’ identification. •	In Sitio KM 30 and Sitio KM 17 in Barangay Dagohoy, soldiers in full battle gear have also occupied community schools and roamed around their premises without offering any explanation. •	Teachers in Sitio Laslakan, Barangay Palma Gil were forced not to proceed to their school after finding out there were more than 40 soldiers camping within the campus. Motorcycle drivers and their passengers were also questioned at military checkpoints. •	Last June 3, soldiers entered the campus in Sitio Nasilaban, also in Barangay Palma Gil, to ask for the whereabouts of the other teachers. •	A flying object suspected to be a drone was also spotted by students during the flag ceremony. This was followed by an order from soldiers for the students to gather vegetables for them. Clod Yambao from UP Diliman’s Art Studies department who recently came back from Mindanao after integrating with Lumad communities said there are schools that still cannot operate because of the Department of Education’s delay in releasing their permits. Due to incessant attacks under Duterte’s martial law in Mindanao, peace advocates have initiated several efforts to help Lumad communities. By posting a geotag logo outside their homes or offices, or on their social media accounts, individuals and organizations can identify themselves as sanctuaries, which symbolizes their support for the Lumad. “It (Lumad sanctuary) is a space that aims to give voice, representation, and fulfillment to the Lumad youth’s dream of education. It is a sanctuary that creates and unravels a concrete and collective action towards the welfare of our national minority,” read a statement by SOS Network.